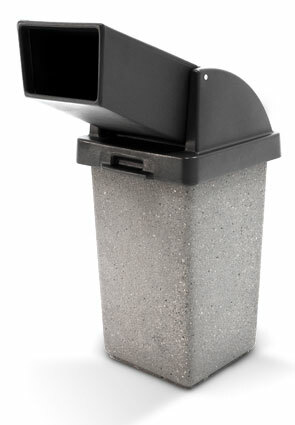 This concrete trash receptacle with the drive thru funnel lid has set the industry standard for fast food restaurants. It can be seen at various drive thru's coast to coast, proving to be extremely useful for customers and greatly appreciated by business owners. The highly functional trash collection chute is easily utilized by drivers side passengers and motor vehicle operators without them needing to exit their vehicle. This classic concrete trash receptacle along with the solid steel-reinforced construction will enhance the entranceways of your facility and will easily withstand the toughest environments anywhere in the world. Security cable, retainer ring, and leveling feet come standard. Drive-Up Chute attaches to existing TF1405 lids but the Push Door needs to be removed. Model TF1401 is the exact same design as the TF1405 just without the Push Door for easy attachment of the Drive-Up Chute.